Acoustic panels provide the simple yet important function of absorbing sound. You can think of them like acoustical black holes – sound goes in and doesn’t come back out. Acoustic panels won’t make the source of sound go away, of course, but cutting down on the harsh echoes and empty ringing sounds coming from the walls can make a big difference. Why does absorbing sound help? Good quality sound absorption will serve to slow down sound wave reflections, cleaning out unhealthy levels of background noise in a room, while restoring the room back to good acoustic balance with good clarity to original sound. For commercial settings, less background noise will trigger a more comfortable acoustic environment for groups of people that congregate in one room. No longer will people need to shout over the background noise to communicate. How do I know what size and quantity of acoustic panels I need for my space? There are two factors when determining the square footage of acoustic panels needed for a given space: the area and surface materials of the space. To calculate the area of the space, we will need to know the length, width and height of the room. We also need to know the surface materials of the space, which includes the walls, floor, and ceiling. Does it matter where the acoustic panels are placed? In general, where you place the acoustic panels in a room is not critical. A visually pleasant appearance is often the guiding factor in placement. The most important thing is simply to get the total needed square footage of panels into the room somewhere. No matter where you place them, the panels will soak up the extra sound that is bouncing off every surface in the room. That said, we do have a couple of non-critical guidelines for acoustic panel placement. First, you get more absorption per square foot of panel when the panel is placed in or near a corner. In other words, you will need slightly fewer panels in your room if you place some of them in or near corners. Second, if there is a primary source of sound in the room, such as speakers in one corner of the room, it’s a good idea to place panels at first reflection points. These are places where the sound can come from the source, bounce once, and reach the listener. For example, on the side walls of a listening room approximately midway between the listener and the speakers. This is because sound that reaches the listener after traveling an indirect path arrives just a little later than sound that came directly from the source. This means your brain has to sort out multiple copies of the same sound, making things sound less clear and making speech more difficult to understand. Adding acoustic panels at the first reflection points reduces the late-arriving sound so your brain can focus on one clear copy of the sound. How are acoustic panels mounted to the wall? Non-changeable acoustic panels are affixed to the wall using security hardware. Changeable acoustic panels can be affixed to the wall either with security hardware or Z-Brackets. What types of acoustic panels are available? Acoustic panels are available in changeable and non-changeable formats. 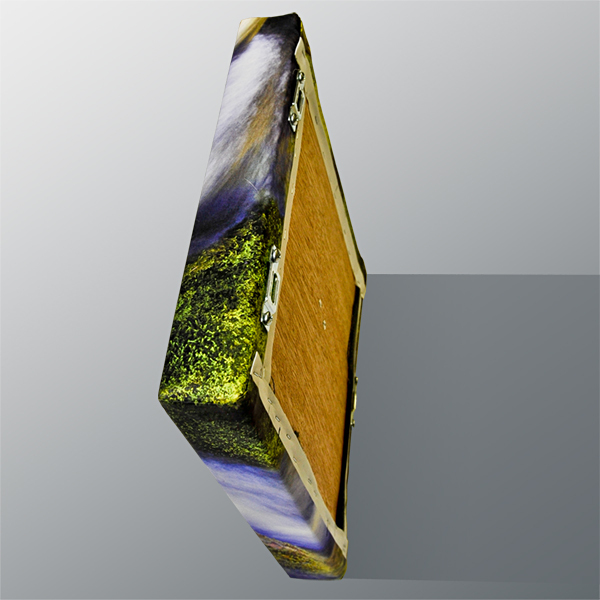 Changeable simply means that the image on the panel is removable and replaceable using image “skins.” Note that all changeable acoustic core materials are housed in an aluminum frame and the image “skin” is stretched over it. What is the largest size available for each type of acoustic panel? Non-changeable acoustic panels are available in sizes up to 48” x 96.” Changeable acoustic panels are available in sizes up to 10 ft. x 150 ft. Panels are manufactured using mineral wool and wrapped in 100% polyester fabric. Panels can be framed with a float frame or standard frame, as long as the frame is deep enough to accommodate the panel. 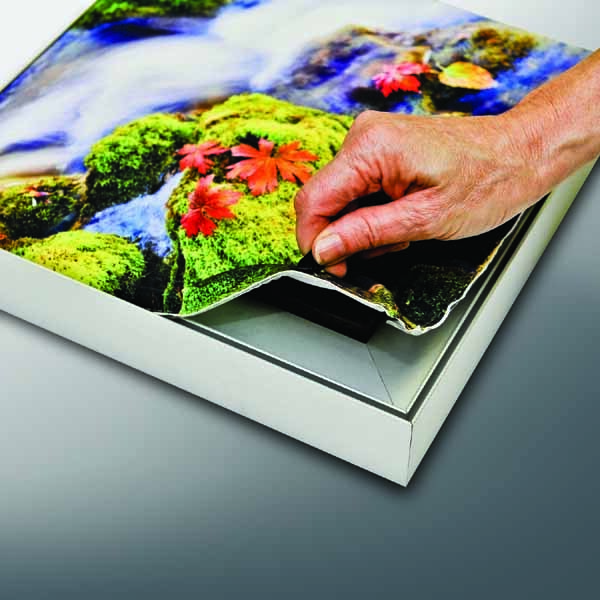 Panels have a ¼” wood back panel for easy mounting or hanging without glue. Professional installation kit and instructions are included at no extra charge. The kit includes aluminum clips, screws, and anchors for neat and secure installation on drywall, concrete, or wood walls. What does the NRC value mean? The Noise Reduction Coefficient (NRC) is essentially the percentage of noise that is absorbed by a material, with 0 being completely reflective and 1.00 being completely absorptive. A value of 0.9 is saying that 90% of the sound that comes into contact with the panel will be absorbed. In essence, the noise in the atrium (where these panels were installed) was now approximately half as loud as before. While results vary based on placement and total square feet of panels, with proper specifications and placement the noise reduction should be between 5dB and 10dB, meaning perception would range from “clearly noticeable” to a reduction by half. What is the turnaround time for acoustic panel production? Typically, the turnaround time for acoustic panels is 2-3 weeks. Who coordinates acoustic panel installations? You may choose to find an installer yourself, but we are experts at coordinating low cost, quality acoustic panel installations for clients. We will hire a local, qualified art installer to install your acoustic panels. Our art installer will install the panels in accordance with our installation instructions and specifications. All installation costs (should you want us to install the panels) will be included in the quote provided to the client. How do I clean acoustic panels once they have been installed? You can use a soft cloth or feather duster to clean your acoustic panels. It is not recommended that you use chemicals, cleaners or abrasive cloths on this substrate because their use could cause damage to the panels.